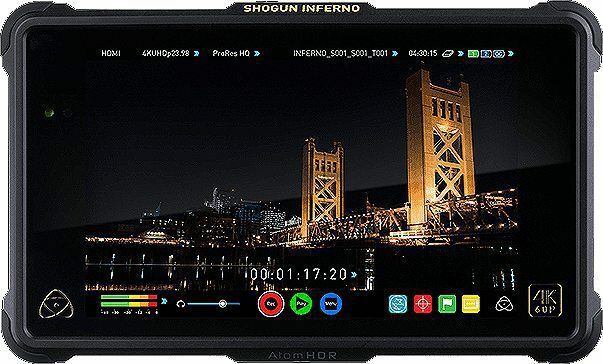 Atomos have a variety of HDR High Brightness Monitor Recorders including the Atomos Sumo 19, the Atomos Shogun Inferno and Atomos Ninja Inferno video recording devices. These devices do more than recording as they are viable HDR production monitors and video switchers as well. You can capture video recorded on any camera and modify the original source video any way you like. 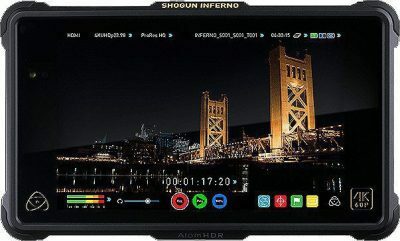 A good example of a high brightness HDR display, the Atomos Shogun Inferno is designed to display images in high resolution without losing sharpness. This device has a 7” display with a resolution of 1920 x 1200 for a superb viewing experience. The Shogun Inferno also boasts of a high brightness of 1500 nits that translates into sharp focus and bright exposure even outside. You can edit recordings in the field straight from the Final Cut Pro X which is a timeline compatible with an I/O box and portable devices. Shogun Inferno uses a special technology called AtomHDR to achieve high definition and just like the Sumo 19; it can show 10+ HDR stops from RAW, HLG, Log or PQ sources in real time using it’s powerful; 10-bit HDR processor. Additionally, a host of gain controls, meters and adjustments are included specifically for frame delay. The performance is impressive as it uses an 18 Core CPU propelled by the 2.3 Ghz Intel Xeon W chip. Transfer speeds peak at 40 Gb/s for I/O, 12 Gb/s for 12G-SDI and HDMI 2.0 and a record write of 500MB/s for its SATA III SSD. These magnificent speeds make cross conversion possible between 1.5G/3G/6G/12G/Quadlink SDI and HDMI 2.0 from the In/ Out connectors. Shogun Inferno has a whopping 14 channels (2 analog I/O and 12 digital I/O), two 48V external microphones and produces a frequency of 96kHz. The storage space for playback is 2TB with 120 minutes possible recording time. Atomos Shogun Inferno is perfect for monitoring because of the numerous tools such as false color, RGB parade, waveform, 1-1 and 2-1 pixel magnification, vectorscope, 3D LUTs and peaking. Other features include a portable playback deck, metadata tags and a 3.5mm headphone jack for playback.